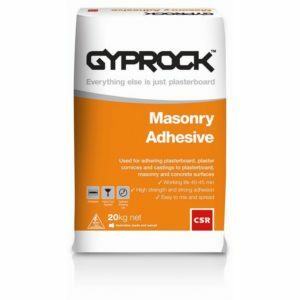 Gyprock Masonry Adhesive is used for adhering plasterboard, plaster cornices and castings to plasterboard, masonry and concrete surfaces. It is a low VOC compound manufactured by Gyprock in Australia to stringent product specifications and packed in an orange coloured bag. 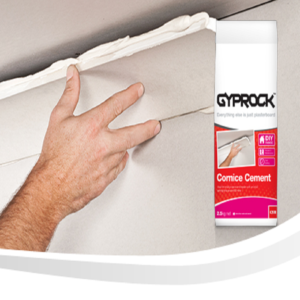 Superior Adhesion Gyprock Masonry Adhesive provides high strength and strong adhesion to plasterboard, masonry and concrete surfaces. 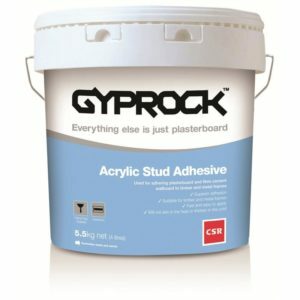 Gyprock Acrylic Stud Adhesive is a pre-mixed adhesive used for fixing Gyprock plasterboard and fibre cement wallboard to timber or steel frames. It has very good initial grab with excellent adhesion properties and will not skin in hot weather or thicken in the cold. It is an easy to use, low VOC acrylic compound manufactured by Gyprock in Australia to stringent product specifications. 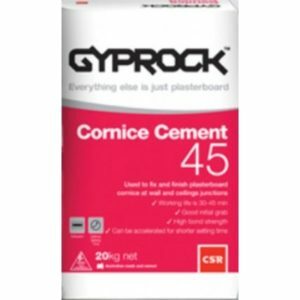 Gyprock Cornice Cement is used for installing Gyprock cornice at wall and ceiling junctions where the walls and ceilings are lined with plasterboard. It is also used for finishing cornice joints and mitres and small cornice repairs. 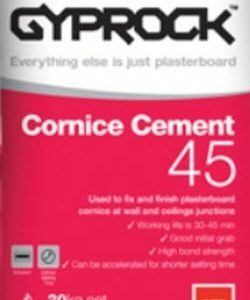 This is a fast setting cement with a working life of 50 - 60 minutes after mixed with water. 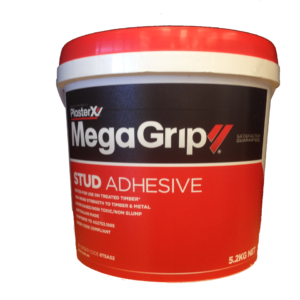 A premium grade acrylic stud adhesive for bonding plasterboard to both timber and steel frames. Manufactured from the highest grade polymers to ensure its no-slump performance and the smoothest, easiest to apply consistency while creating a high bond strength. 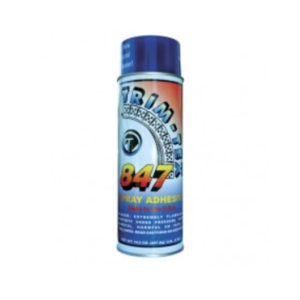 SUITABLE FOR STYRENE PANEL APPLICATIONS.